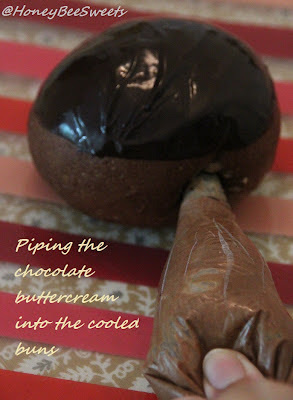 I realise it has been awhile since I posted something on chocolate. That is so unlike me! 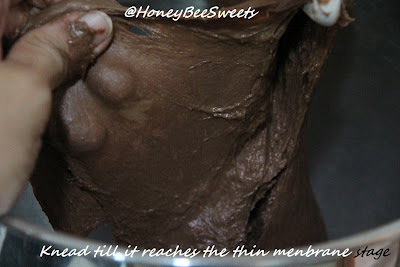 I guess I have been re-baking the old chocolate recipes and thus not looking out for new ones. 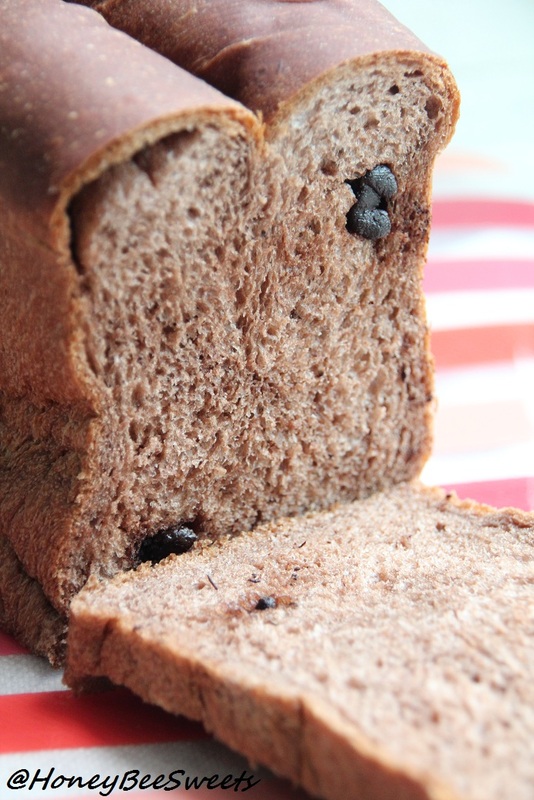 Well, don't fret chocoholics (including yours truly), today I've just another yummy chocolate bread post, sure to quench your love for it. 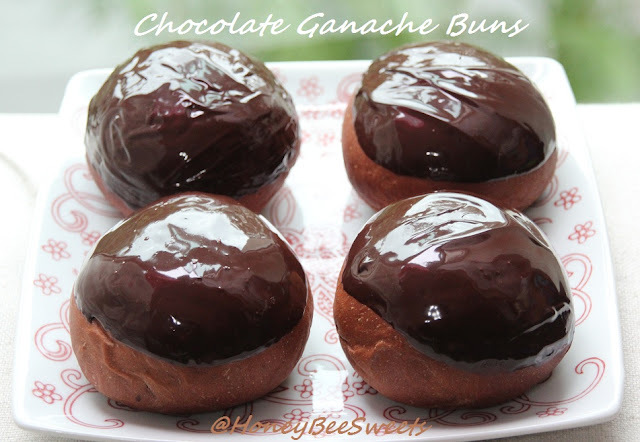 :) The main reason why I did this recipe was because of my younger kid whom love this particular chocolate bun which was sold in a bakery store in Malaysia. She would ALWAYS ask me to buy that chocolate bun for her. ;P So why not bake some myself? 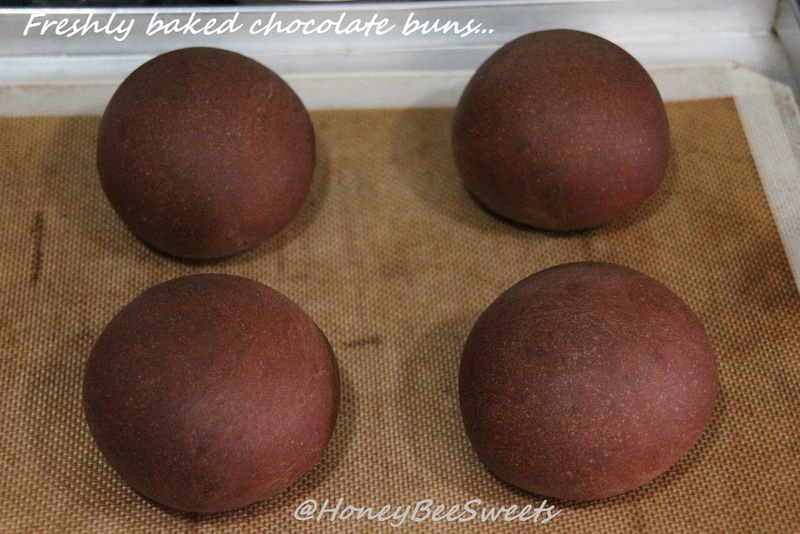 Besides these yummy chocolate buns, I made a chocolate bread loaf as well. Both delicious! This recipe was actually done a month back but only got to post up now. But I am already thinking of baking this again next week, heehee. :D I saw this recipe from here, but I made some changes to it. 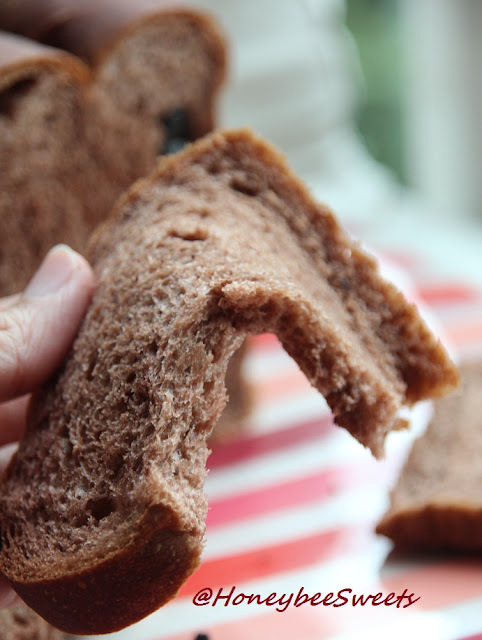 I added a pre fermented dough to the recipe to introduce better elasticity texture to the bread. I like the extra Q Q taste. :) Note that I doubled the below recipe which allowed me to bake a loaf (9x5x4) and 4 buns. Knead all ingredients of the main dough together, except the butter. Add pre-ferment dough piece by piece. Knead after each addition until soft and smooth. Add butter. Knead until stretchable consistency and pass the window panel test. 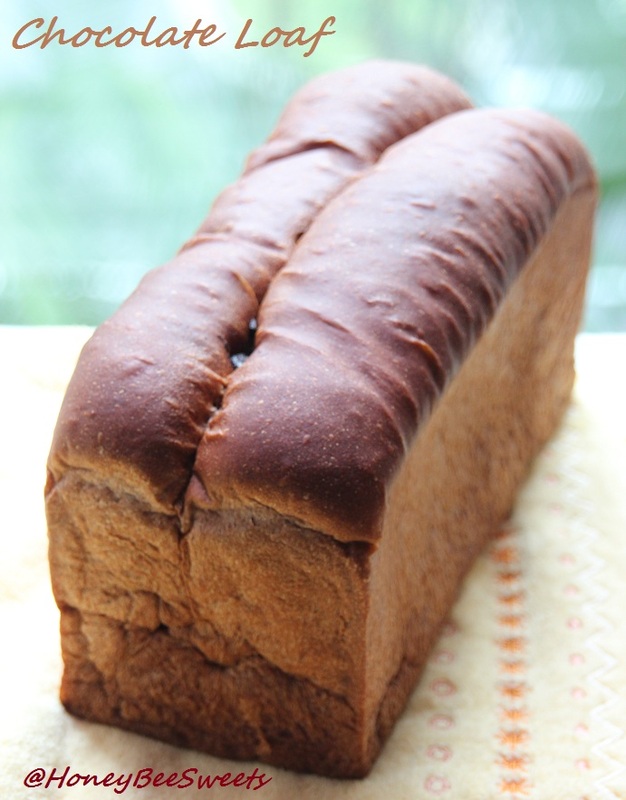 If making a loaf: Divide the dough into 3 equal portions. Flatten each portion with your hands to drive the air out. Roll it into square shape, cover and let rest for 20 minutes before shaping. If making buns: Divide the dough into 50g per portions. Roll round and seal any edges. Let proof for 25 to 30 minutes till double in size. Flatten the dough to drive the air out. 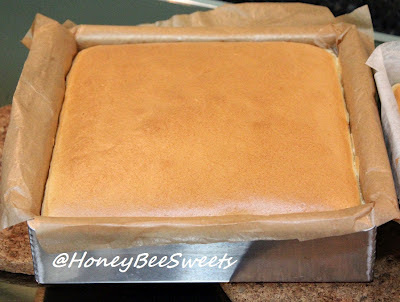 Roll each out into a rectangular sheet with a rolling pin. Fold about 2cm from both sides towards the center and roll it out again. Roll the dough up like swiss roll (the width should be the same as the tin) and out them into the mould. Repeat for the rest of the dough portions. Cover with cling wrap. Let it prove for about 45 minutes or until the dough has risen to 80 to 90% of the depth of the loaf tin. You can either cover the lid or bake it open top like mine. If open top, brush with egg wash.
Bake in 175C oven for 12-13 minutes for buns and loaf for 30 to 35minutes. Okay folks, gonna sign off now. Have a good day all! This pancake uses the usual egg yolk and egg white separation method. Although this method is slightly more tedious compared to the usual whole egg method, but it yields a much fluffy and soft texture. So get whipping! Peel and core the two apples. Slice the apples into 8-10 wedges each. In a saucepan, add in sugar and a tbsp of water and on the fire at medium. 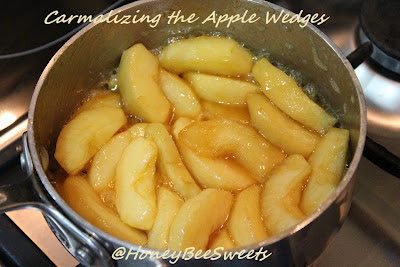 Once sugar solution starts to turn amber, quickly add in the apple wedges and stir in well to coat. At this point, lower the heat to medium low, add in the butter and stir well to thicken the whole mixture. Lastly add in the vanilla extract and cook for another minute. Let it cool slightly before use. In the meantime, prepare your pancake batter. In a large mixing bowl, add in the egg yolks, vanilla extract, fresh milk and vegetable oil, stir well. Now sift in the cake flour and baking powder to the egg yolk mixture. Mix well and no visible lumps. 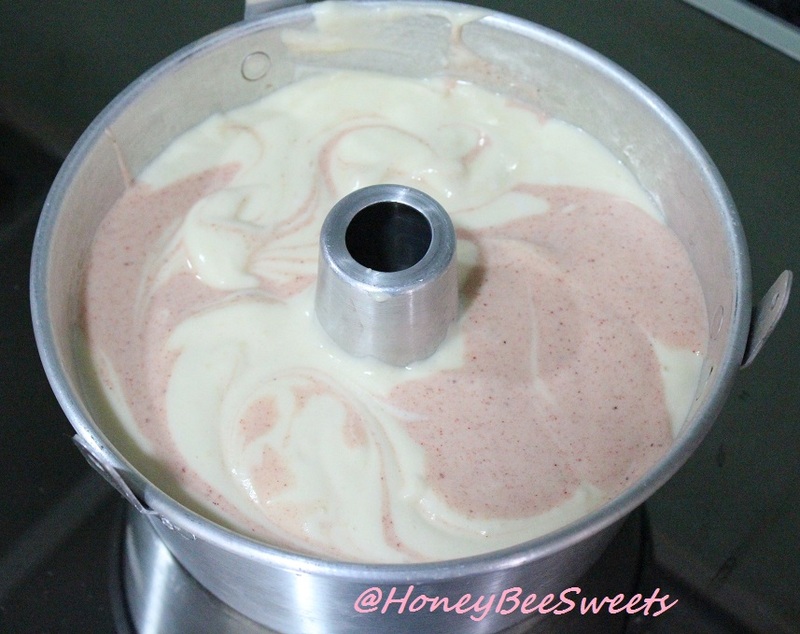 In another mixing bowl, beat the 2 egg whites till foamy, then add in the caster sugar gradually and beat till stiff peaks. Fold in the whites to the yolk mixture in 3 separate portions and careful not to deflate the white. Pour the batter into the preheated pan. 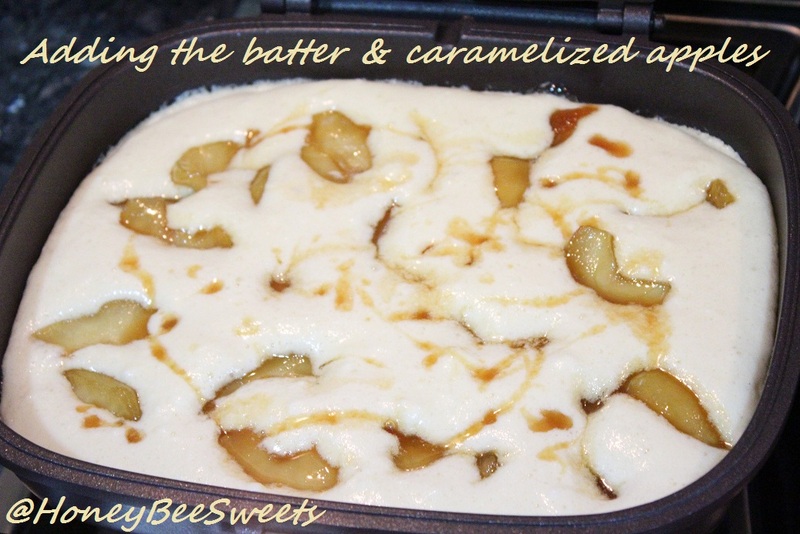 Then start adding in the caramelized apples wedges, making sure the wedges are well distributed over the pancake. Drizzle in the caramel over the batter as well, you don't want to waste that golden nectar. Flip the pancake after 5-7 minutes at medium low heat. If you are not using Happycall, just use a big plate to help yo. 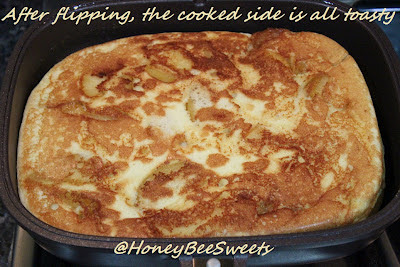 Simply slide the pancake out onto the place the cup it down with the toasted side up this time. Cook for another 5 -7 minutes then check if the pancake is golden brown. Once done, remove pancake and serve while still warm. Cookbook suggested dusting the pancake with cinnamon powder and powder sugar, I omitted that since my kids aren't fans of cinnamon and I find the sweetness of the caramelized apples were just nice pairing with the pancake. Delish! 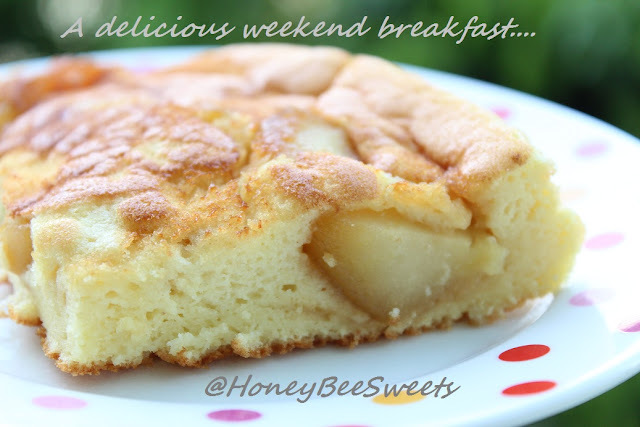 Hope this recipe will motivate you to make it for your family tomorrow...it's Sunday! It's delicious and much healthier then those hawker food or big breakfast at fast food chains. Best of all, it's made with TLC. I love light cheesecakes. It satisfy a craving and yet less guilt involved. I have tried a few versions of light cheesecakes before, all light and creamy but still has a slight differ in texture if you ask me. The first Feather light cheesecake I attempted has a large amount of milk in the recipe, and so it has a more milky taste to it. 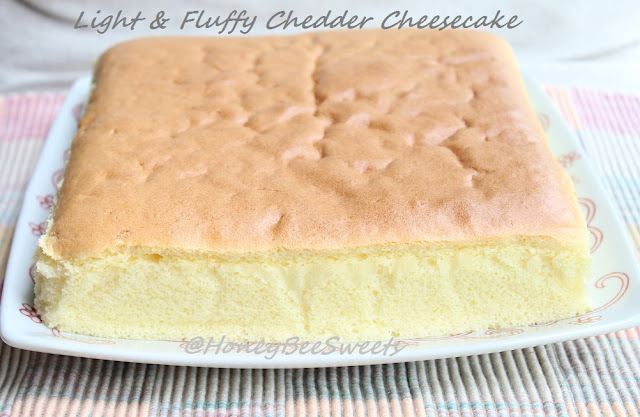 As for the Japanese Light Cheesecake I tried, it is creamier with a higher ratio of cream cheese. However the lemon juice used in the recipe really "brightens up" the taste, makes it even easier to down. (吃了不会逆). 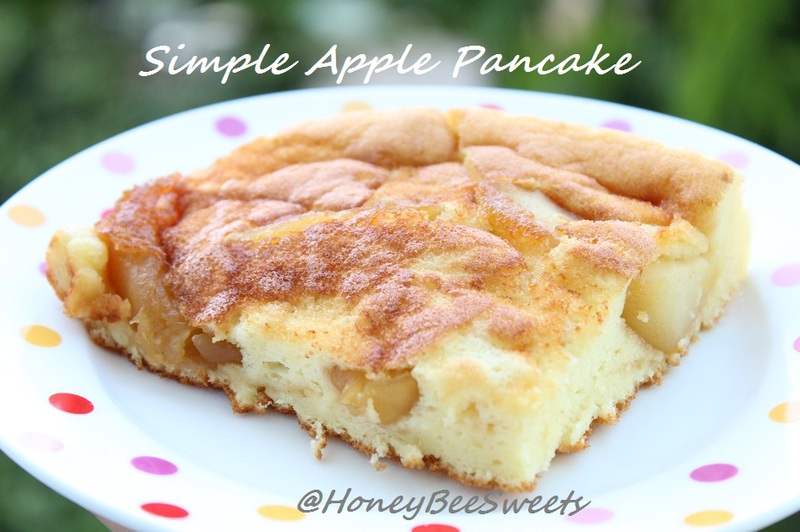 I got this great recipe from 星厨房, will re-post it here for easy reference. ;) Thanks hsling! In a heatproof saucepan, place the butter, fresh milk and tear up the chedder chesee slices in. Ladle big spoonful of the milk mixture into the egg yolks. Mix well and then add in the rest of the milk mixture in. Stir well. 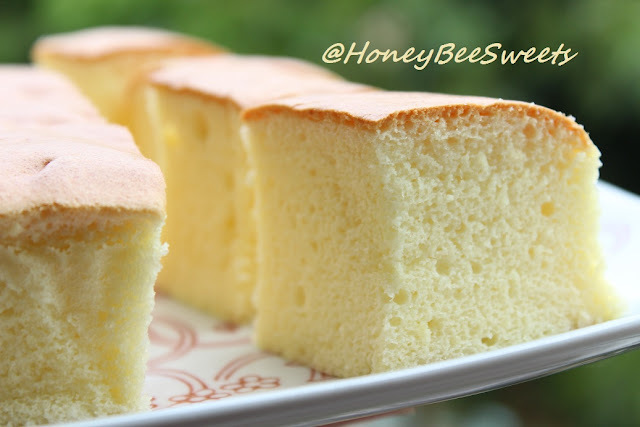 Sift in the cake flour into the egg yolk mixture and make sure no lumps. Preheat the oven to 155C with a water bath. Grease and line an 8x8 square baking pan. In another large mixing bowl, add the egg whites in and beat till foamy. Add in the sugar gradually and beat till stiff peaks. Gently fold in 1/3 of the egg whites portion into the cheese mixture. And repeat with the other 2 portions and careful not to deflate it.Pour the batter into the prepared pan and smooth out the surface. Bake the cake in the oven for 50 minutes or till the tester comes out clean. 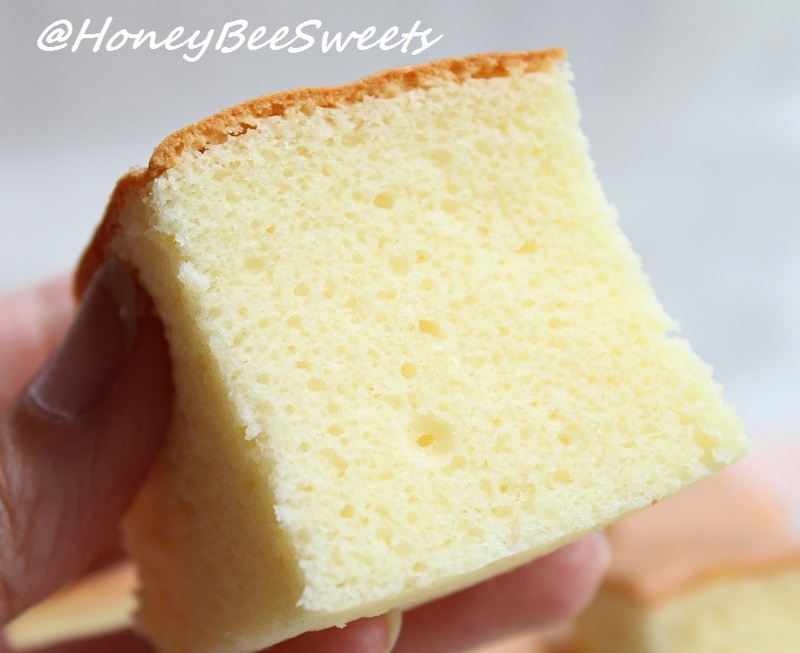 Let cool for 5 minutes in the pan before removing and let cool completely before slicing. Anyway, enough babbling, back to today's recipe. 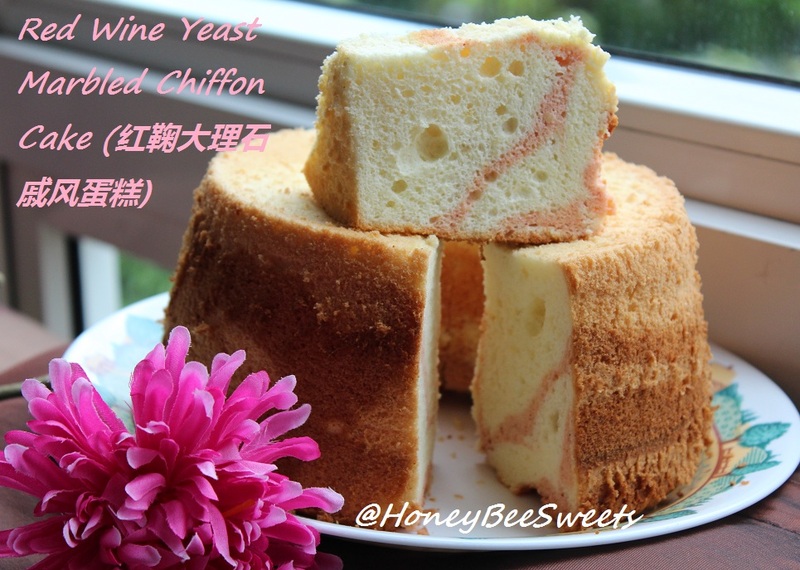 It's Red Wine Yeast Marbled Chiffon Cake (红鞠大理石戚风蛋糕). In a large mixing bowl, beat the egg yolks with caster sugar till thick and creamy, about double in volume. Then add in the vanilla extract and mix well. Add in the vegetable oil, followed by the fresh milk into the egg yolk mixture and stir well. Then sift in the cake flour and baking powder. Mix till no visible lumps. In another large mixing bowl, beat the egg white until foamy, add in sugar gradually and beat till still soft peaks, add in the corn flour and continue to beat till stiff. Gently hold in 1/3 of the white into yolk mixture. Then repeat with 2 more portions till all is folded. Take 1/3 of the batter and mix in the red wine yeast into it till well combined. Pour the plain batter into the tube pan first. Then place spoonfuls of the red wine yeast batter into the tube pan. 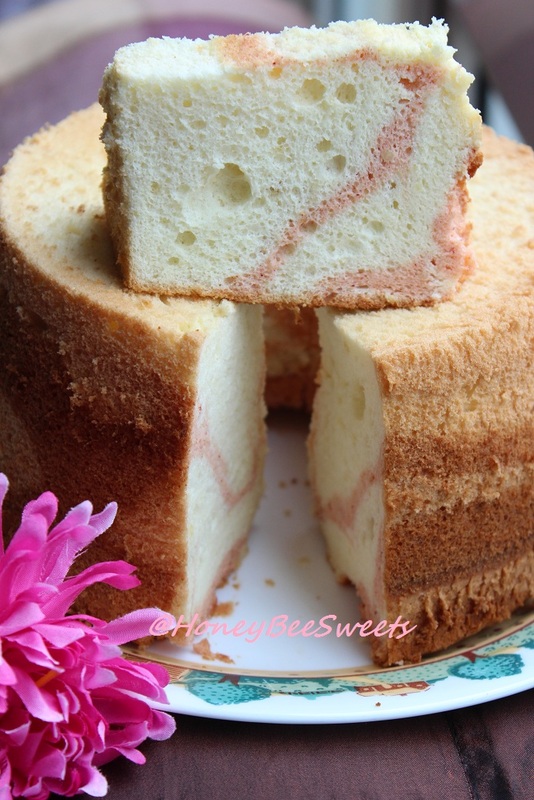 Then use a toothpick, swirl the batter to create a marble effect. 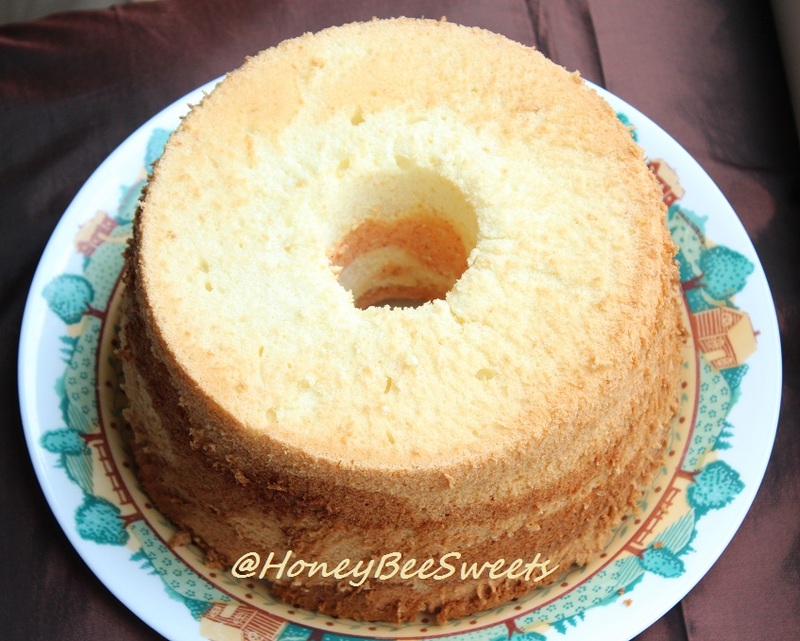 Place the cake into the oven to bake for 28-30 minutes till the tester comes out clean. Remove from oven and invert to cool completely before removing from the pan. Thanks all for staying on with me. ;) Have a great evening all! 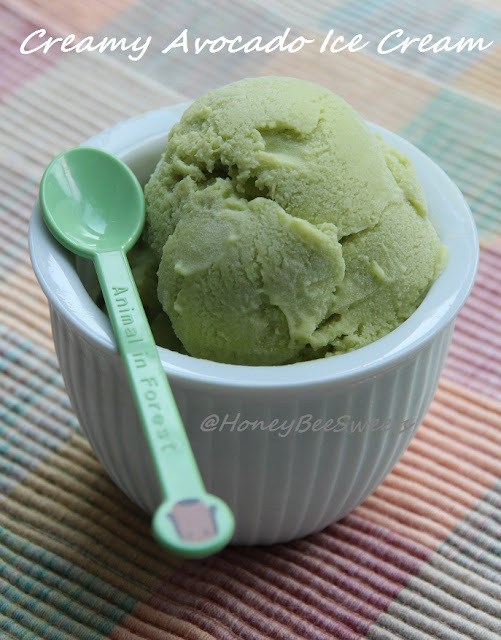 I got this nice avocado ice cream recipe from FoodNetwork, courtesy of Alton Brown. Although initially I was complementing whether to try out Eelin's Avocado ice pops recipe. But decided to go with Alton Brown's version since I've tasted the sinfully good version from "The Daily Scoop", plus I'm such a sucker for creamy stuff. Lol! Add the avocados, lemon juice, milk, and sugar to a blender and puree. Transfer the mixture to a medium mixing bowl, add the heavy cream and whisk to combine. Place the mixture into the refrigerator and chill until it reaches 40 degrees F or below, approximately 4 to 6 hours. 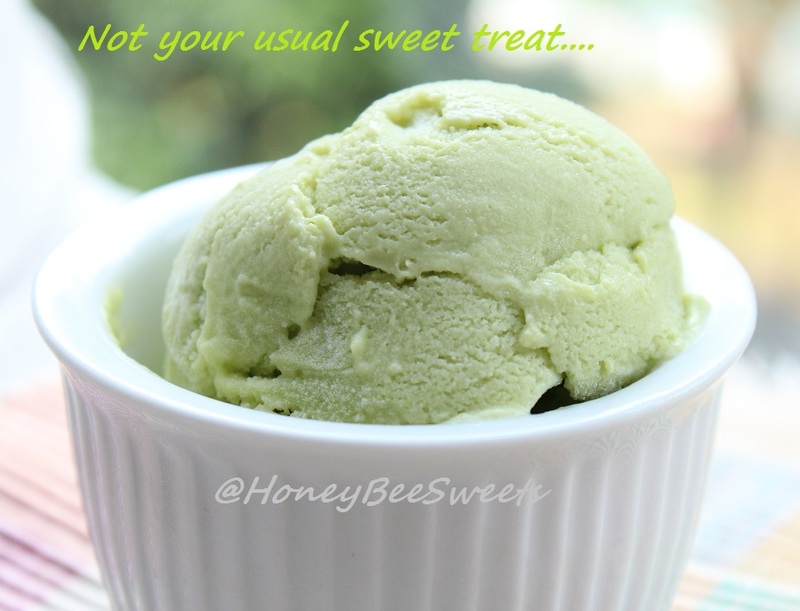 Process the mixture in an ice cream maker according to manufacturer's directions. Alternatively, if you don't own an ice cream maker, beat the mixture at high speed using your handheld mixer till it thickens. Then place in the freezer for an hour. Just as the mixture is going to freezes up, beat the mixture again, then chill again. 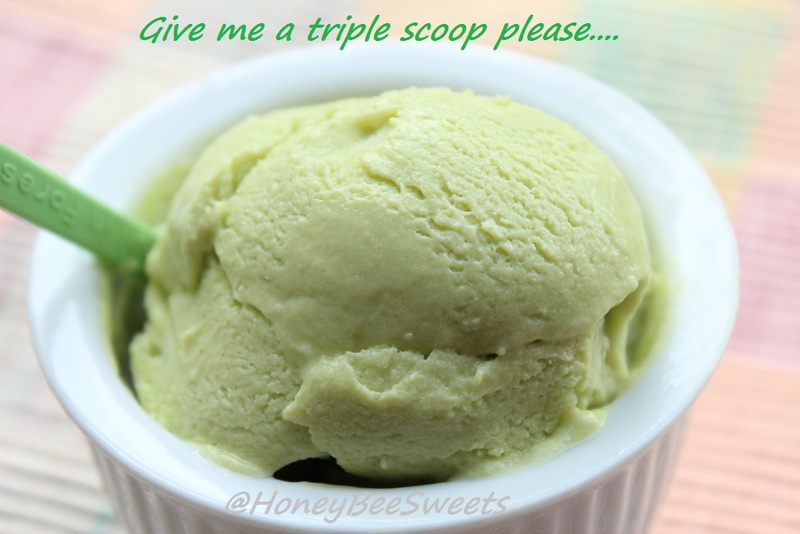 Repeat this step about 2-3 times to reach a thick creamy consistency...something like soft-surf ice cream. Pour the mixture into a container and freeze overnight or up to 4 hours. If you have tasted avocado ice cream before and love it as much as I do...I highly recommend you try this out. There's no raw eggs involved and yet it has this really creamy texture due to the avocado used, really yummy. Thanks all for dropping by! Have a great day. Cheers!